Home / Home Buying / Should I buy mortgage points? Should I buy mortgage points? With all the specialist terminology involved, buying a house can feel a little like learning a foreign language. Today in lessons on real estate speak: buying mortgage points. When you buy points (also known as discount points), you’re paying your way to a lower mortgage interest rate. Think of it as pre-paid interest. For every point you buy, you’ll usually knock 0.25% off your interest rate. Sound good? Not so fast. To decide whether to pay for points, you’ll need to balance the short-term cost of the points against the long-term savings you’d get from a lower interest rate. First off, don’t buy mortgage points if you can’t afford to. You’d be surprised how many people chase after low interest rates at the expense of saving for emergencies and keeping to a budget. Points aren’t free—each point will cost you 1% of the loan value. If you are taking out a $200,000 mortgage, buying a point will cost you $2,000. Two points will cost you $4,000. You get the idea. And this is on top of closing costs. If paying for points would leave you short on cash for necessities, or cut into your emergency fund, skip it. Don’t get so fixated on securing the lowest possible interest rate that you lose sight of your budget and put your financial health at risk. So you’re comfortably within your budget and your emergency fund is in good shape. Before you apply spare funds to buying mortgage points, consider this question: what would you do with that money if you didn’t buy points? If you have high-interest credit card debt, put extra money toward paying off your consumer debt before you buy points to lower your mortgage interest rate. Is your down payment 20% or more of the home value? If not, you’ll need to buy private mortgage insurance (PMI). If instead of buying points you could put more money down, pass the 20% mark and eliminate the need for PMI, go for it. If your 401(k) comes with employer matching and you’re not already contributing the maximum match-able amount, don’t buy points. Put that extra money into your 401(k) and take advantage of the free money from the match. If you don’t have health insurance, buy yourself a policy before you buy points on your home loan. Health is wealth! The money you pay up front to buy points will lower your monthly mortgage payments, but it will take a while for those savings to equal the amount you paid. This break-even point will depend on how much you pay for the points and how much you would save each month, plus what you would make on that money if you invested it instead. If you think there’s a good chance you’ll move before the break-even point, buying points probably isn’t right for you. That’s because the longer you stay in your home past the break-even point, the more time you have to reap the benefits of buying discount points at closing. If you think the house you’re about to buy is your “forever house” and you’re otherwise in good financial shape (see above!) go ahead and buy points. How much do you like the house? Is it the right size for your family? Will you be having more kids soon? Becoming an empty nester? How likely is it that you will move to a different city to find a new job or take care of an elderly relative? Will the house need expensive repairs and maintenance? Is the house in an at-risk zone for floods or fire? Does the neighborhood seem to be getting better or getting more run-down? Do the local schools meet your family’s needs? How long is the commute to your workplace? Buying mortgage points on a property you think of as your “starter home” isn’t always the best use of your hard-earned money. If you have a little cash left over month to month and your loan doesn’t come with prepayment fees, you can always send in some extra money with your mortgage payment and indicate that you’d like the money to go toward paying off your principal. Another long-term consideration is interest rate fluctuation. 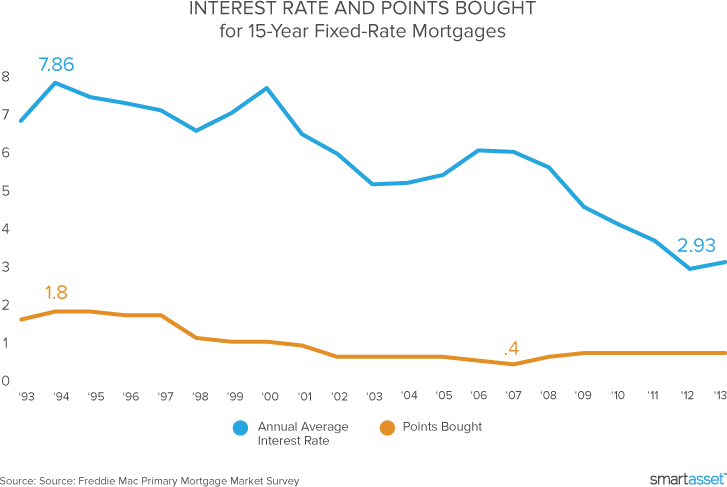 What if you buy points and then a few months later interest rates fall across the board? Suddenly, lenders are offering mortgages with interest rates below the one you paid points to secure. To take advantage of those low interest rates you may have to go through an expensive refinance and forfeit the loan you paid for. Have you shopped around for different mortgage lenders? Are you sure that the rate you’re considering tinkering with by buying mortgage points is the lowest rate you can get? Only think about buying mortgage points if the answer to both these questions is “yes.” Why? Because one lender may offer you a low rate that another lender only offers after you buy points. If you have an imperfect credit record but are now on the right financial path, you may feel that the mortgage interest rates available to you are unfairly high. In that case, buying mortgage points may be your only road to affordable interest rates. Consider your long-term plans and weigh the decision to buy points against other ways to spend your money. If you follow the four rules above, you’ll make an informed decision you can feel good about. If only choosing a home were this easy! How do "points" impact closing costs?